This is the second of four posts which look at Americas best boxers in each of the main weight classes chosen by me. Part one looked at American boxers in the heavyweight and light heavyweight divisions, now it's time to take a look at the super middleweights and middleweights. Andre Ward – To the expectations of many readers of this article, I am choosing unbeaten super six winner Andre Ward as the best super middleweight in America. Easily beating world class opponents like Mikkel Kessler and Carl Froch proves that he is a very special talent. If he were to beat IBF belt holder and fellow unbeaten boxer Lucian Bute, he could make a good case for being the best boxer on the planet. Andre Dirrell – Dirrell lost a lot of respect from his fans when it appeared that he faked being badly hurt by an illegal shot Arthur Abraham threw while Dirrell was on the canvas. What made this worse was that Dirrell was easily ahead on the scorecards at this point so he had no reason to do this. Before his DQ win to Abraham, many thought Dirrell was unlucky not too get the nod in a close fight over super six finalist Carl Froch. Dirrell looked impressivee in his most recent fight against Daryl Cunningham. Kelly Pavlik – The pride of Youngstown, Ohio, Kelly Pavlik comfortably won but didn’t look impressive in his first fight and win at super middleweight to then unbeaten Alfonso Lopez. Pavlik was scheduled to take a tune up fight against southpaw Daryl Cunningham and then fight Lucian Bute. But Pavlik had problems outside of the ring and dropped out of the Cunningham fight at very short notice. The good news is that Pavlik is now working with Robert Garcia and may have found his love for boxing again. Anthony Dirrell – Another unbeaten American on the list, brother of Andre – Anthony Dirrell is the official mandatory for super six winner Andre Ward. Anthony has fought nobody of note so far, and it would be a huge leap up in class for him to fight Olympic gold medallist Andre Ward. He should face some top 10-15 ranked opponents first before stepping in the ring with Ward. Allan Green – Green has lost against two of the best opponents he has faced, Andre Ward and Glen Johnson. Since his second loss which came to the hands of Glen Johnson, he has won two fights on the trot and is looking to work his way back up to a world title fight. Peter Quillin - ‘Kid Chocolate’ stopped ex Wildcard gym trainee Craig McEwan in the sixth round of their fight, whilst leading on all of the judges scorecards from start to finish. 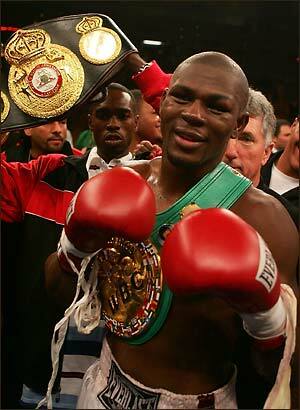 He looked good against his toughest opponent to date and has made a name for himself in the middleweight division. He has been rumoured to fight Andy Lee sometime this year. Sergio Mora – With the greatest respect to the American middleweight boxers out there, there isn’t many to choose from. This is why I have to include Sergio Mora who has been in poor form recently, in third place. Mora’s most notable fights are a win and loss to the late Vernon Forrest, a draw to ‘Sugar’ Shane Mosley and a loss to Andy lee victim – Brian Vera. Mora stopped his last opponent, but something tells me he will have to do a lot more of that before even being considered to fight a middleweight belt holder. Brian Vera – Vera is another boxer who would never make it into a top five list in a weight class full of American talent. The middleweight division has American talent, but the really good talent stops at number two in the list. Vera earned his career best win by beating the man a place above him in the list; he won the contest by split decision in a close fight. His last fight, a loss to Andy Lee was not close. He was outclassed in every department. You can’t help but think Vera is now just a stepping stone for fighters progressing through the ranks. Or perhaps that was always the case. Caleb Traux – Unbeaten Caleb Traux scrapes his way onto the list. Traux has a record of eighteen wins, with ten by knock out. He has fought no one of note and holds some alphabet USA middleweight belt which doesn’t mean much. Because he hasn't fought anyone recognisable in the boxing world there is not much to write about him. Right now he is just a prospect, and one who has made it at fifth place in a decent division, but a bad one for American boxers at the moment. That's my take on Americas best talent in the middleweight divisions. Be sure to check out post three which looks at Americas best boxers in the light middleweight and welterweight divisions. Thanks for reading.